Beth Conroy is no ordinary heroine. She's a middle-aged vagrant with lack-lustre hair over a parched and haggard face and for some reason, she's traveling alone in one of the most harsh, dust bowl regions of Australia. When she settles for the job of cook at a filthy lumberjack's camp for pittance, the reader can't help wondering why she'd bother. Her plucky and unflinching spirit and the way she handles herself in an environment that would send any other woman running is incredible. The question which begs answering is what has happened in Beth's past to bring her there. That is the question which the rest of the book answers. The story weaves deftly between scenes from Beth's former, completely different lifestyle and her new existence at the camp. When I found out the horrendous circumstances she suffered, my admiration for her increased tenfold. Is there a chance that anything good can enter Beth's life in such a seemingly God-forsaken place when everything that ever meant anything to her had already been stripped away? Can she possibly bring her innate strength and goodness to help anybody else, releasing her personal bitterness and anger at the same time? Can there be such a thing as renewed love in her life? I must warn other readers to keep a box of tissues on hand. If you're like me, you'll definitely need them. It's no surprise that it takes a remarkable author to create such an amazing heroine. Roz Baker is a national speaker and author who travels around Australia sharing her own story of survival from brain surgery as well as how she has managed her career as a self-published author with incredible success. 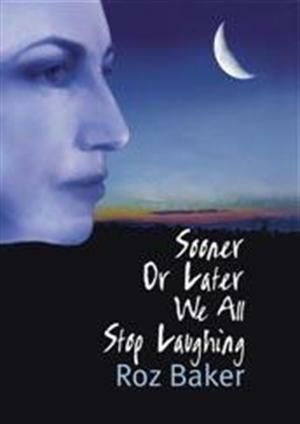 "Sooner or Later we all Stop Laughing" is now in its 4th print run and selling even better than it did when it was first released in 2004. Over 20 000 books have been sold in the trilogy. You can visit her at www.rozbaker.com.au or contact her at PO Box 4003, Forster, 2428 NSW. Her new book, "Seed of Hope" is also available as both hard copy and e-copy for kindle. The author of this book, Dave Bell, admits that in his former life he graduated from the school of hard knocks, "majoring in the art of working really hard while going broke slowly." That surely struck a chord with me and I was fascinated to learn how he got himself off the treadmill and began work on this book to celebrate. The cover alone reveals that this is a unique book. Dave and photographer James Morcom notice quirky and often unexpected relationships between nature and methods of earning money. Each stunning double page features a brilliant nature photograph including many Australian ones, along with a corresponding insight about aspects of money making such as business dealings, the share market and my favourite, the buoyant and persistent attitude necessary to keep our dreams alive; the same attitude which helped them to write and market the book. I found it easy to get lost in the apt beauty of their analogies between nature and business. The book invites us to ponder ways in which we may change our own lives for the better. As I told my 7-year-old son when I brought the book home, adults need picture books too and perhaps many of our grouchy and short-sighted problems begin when people begin telling us that we don't. I met Dave Bell last week while we were both selling our books at the Spring Expressions Festival at Stirling, in the Adelaide Hills. During the course of the day we got talking and Dave shared many of his intriguing reflections on money and life, which is what his book is all about. It was an ideal setting for a chat and I appreciated his encouragement and friendliness. I was delighted to be able to swap him a set of my "Quenarden" fantasy adventure novels for a copy of "The Gardener's Guide." The sumptuous looking front cover allured me to get stuck straight into this novel. I found myself entering a scenario that reminded me of a Cluedo game. It's the 1930s and some nasty business is afoot in the stately Mellington Hall. Somebody is determined to kill our hero, Sir Alan Mellington. Is it his philandering younger brother, Simon? Is it Rupert, the attentive valet? Or maybe the gruff housekeeper, Mrs Mirren? The only person Alan can completely trust is Miss Sarah Montgomery, the daughter of his gamekeeper, but because of him, she's been unfairly branded as a promiscuous woman and ostracized from her parish and village. I found I had a double reason to read the story very quickly. Apart from wanting to discover the identity of the would-be murderer, I wondered how on earth can these two possibly become romantically involved? It's a plot that could only happen in the class-conscious Britain of yore, and if I were Sarah, I don't know if I could have forgiven my parents so easily coming from a twenty first century perspective. That's another hook for you ladies to get hold of this book. And don't forget a block of chocolate and nice, steaming cup of tea. Meredith Resce's period drama romances are well-known and widely loved by many readers. Back in 2000, she helped me publish my first novel and I'm equally grateful for the friendship and encouragement she's given me for over a decade. If I hadn't known there was another Christian fiction author in Adelaide whose advice to seek, there's a good chance I'd never have gotten anywhere with my own books. This book is a must-read for any Aussie who has enjoyed reading the abundance of American historical, frontier-style fiction available on our market. There is nowhere near as much authentic Australian material and truly needs to be, as the history of our Great Southland is equally rich and colourful. Carol Preston has taken upon herself the job of researching her family tree in early settler times to bring us an awesome story based on true people and facts. Written as a fictionalised account, we get to share first-hand the gruelling journey aboard a convict ship, the challenge of setting up subsistence living in a land which is hotter and harsher than anything anybody had imagined and the heartache of losing beloved babies in a time of scanty medical development. The wonderful descriptions of our wide, sunburned land can only have been written by an Aussie who lives here and knows what she is talking about. Her characters are the lovable type who I find can't help rubbing off on our own attitudes and making us better people. The hero, William Douglass' staunch optimism has an input on his fellow characters from the 1700s and modern readers alike. His sweetheart and later wife, Mary, is so easy to relate to and understand that we can't help loving her. I appreciated it that her emotional ups and downs were written so convincingly that she shone through. "Mary's Guardian" is a finalist in the 2011 CALEB fiction prize, alongside Mary Hawkins' "Justice at Baragula" and my "Best Forgotten." Mentioning that these books are so completely different from each other is a huge understatement. I'm sure we'll all be full of nerves and anticipation on the night of the announcement on November 11th. Readers of the two prequels to this book surely know that Mary Hawkins has a skill for delving deeply into the secret and most protected thoughts of her characters' hearts. Anybody looking for a story in which hidden layers and complexities are gently revealed and healed with God's love can rest sure in the fact that she'll deliver what you hope for. I love the honest and true-blue setting of this series; the town of Baragula and its outlying properties. The characters are the sort of hard-working and quietly humorous country folk who deserve to be featured in novels, as they are true heroes who form the backbone of our country and often remain unsung. Those who have already read Return to Baragula and Outback from Baragula will be happy to see the way in which the relationship between town cop, Bradley Hunter and his estranged sweetheart Madeline Honeysuckle unfolds. I love Brad because there is something special about a person who begins life with circumstances seemingly piled up against him, yet makes something of himself that we can truly admire. The secret Madeline keeps to herself, which has been hinted at in the former novels, is at last revealed to our shock. I'd definitely recommend that if you haven't read the first two books, do so before you read this one, as it ties the story up beautifully for everybody. I've had the pleasure of meeting Mary Hawkins a couple times at Writers' Fairs and look forward to seeing her again in November. She has encouraged me from the time I launched out and published my first novel back in 2000. Being a newbie on the market then, I appreciated the enthusiastic letter I received from Mary, an established and beloved author. For the last two years we have both been finalists in the CALEB fiction award, an unforeseen twist which scares me a bit when I stop to think. I feel as if my feet haven’t touched back into the real world yet. Many-Coloured Realm is like no other parable, fantasy, allegory or epic I’ve ever read before. What a stunning stand-off between the forces of good and evil! Those fantastic characters have still got a hold on my mind. Genius! Robby and Chris have entered the shabby, colourless realm of the goblins to rescue Chris’ brother Stephen from a hopeless looking predicament. But how can they help when the king of the goblin realm is so deliberately vague about what their quest will involve? What is he trying to hide? Their journey to find out involves meetings with elves, sprites, sirens, a helpful muse and a forgetful phoenix. What they finally discover is mind-blowing. As a fantasy author and homeschooling mother myself, plenty of fantasy has passed through our doors. Lewis, Tolkien, Rodda, Rowling, L’Engle and Colfer to name just a few. Many-Coloured Realm is second to none. A book that combines drama and science with nail-biting suspense is a book to be held onto. Add the whimsical and hilarious and you have a classic! I was pleased to find out that "Many-Coloured Realm" picked up a finalist award in the International Book Awards for 2011. This is a book of 1oo devotions for busy mothers. Narelle Nettelbeck understands how worn out women can become as we try to juggle many different aspects of daily life at once. She also knows that the encouragement we need to fulfill our roles is sometimes a long time coming and has taken it upon herself to fill the gap. Each of these devotions is pure gold, never condemning but always convicting in a very gentle way. They have also helped to transform my vocabulary. Things I once called "mundane" have now become "noble". It's a book that lives up to its title. I never thought I'd say this, but as I read I found that I truly was thankful for my dishes. I've known Narelle for a few years now, and earlier this year I was delighted to be able to meet her in person when I attended the Word Writers Fair in Perth. Being shown some of the sights of this beautiful city with Narelle and her family was one of the highlights of my trip. It's great to see that "Thankful for Dishes" has been listed a finalist in the Bookseller's Choice section of this years CALEB Awards. STREETS ON A MAP by Dale Harcombe Abby, a successful singer in metropolitan Sydney, marries Joel and moves to Astley, the country town he was raised in. Feeling shunned by the locals and at a loss for things to do, she must get creative. Before long, Abby discovers that life in the small town holds more in store than she ever anticipated. Astley turns out to be a paradigm of the wider world. Normal people lead lives of quiet heroism. Every day is full of noble gestures that may go unnoticed in the grand scheme of events, yet have the power and potential to change the lives of others. A deliberately lit fire, a baby's early delivery, a brand new business, the return of an estranged sister and a cold-blooded attack are just some of the issues dealt with in the story. As the characters are all honest, regular, down-to-earth people, it's no stretch of the imagination for readers to see that we too, may be a source of huge blessings. It is a story of how small ripples may have more far-reaching effects in our sphere of influence than we may imagine. Beautiful reflections about relationships and the Australian lifestyle make "Streets on a Map" the sort of book that helps us to realize the value of what we have. I found myself refreshed with a renewed sense of optimism and contentment by the finish. I met Dale Harcombe once, when we both in Brisbane in 2007 attending the Alpha to Omega Writers conference. Since then, we've been members of the same prayer group. I was delighted for the chance to be able to swap one of my books for "Streets on a Map" and review it.